MYRTLE BEACH, S.C. (JUNE 16, 2014) - The Texas Rangers have made the following transactions that affect the roster of the Myrtle Beach Pelicans. Left-handed pitcher Will Lamb has been promoted to Double-A Frisco. There is no corresponding roster move at this time. 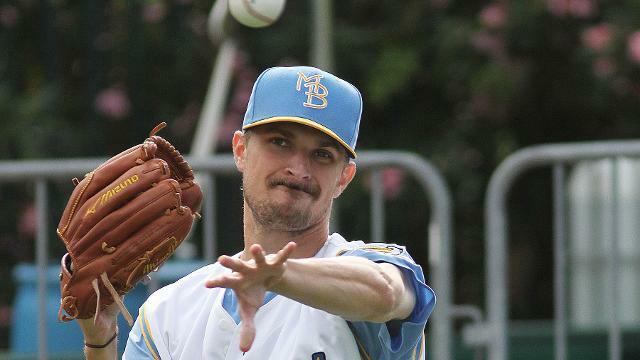 Lamb, 23, earns the promotion after less than two months with the Pelicans this season. The former Clemson Tiger is in the midst of 7 2/3 innings scoreless streak spanning five appearances and is 1-1 with a 2.41 ERA on the year. He is also two for three converting save opportunities. The southpaw began the year in Extended Spring Training and was promoted to Myrtle Beach on April 18. Over his last three outings, Lamb struck out eight Carolina Leaguers, allowed no walks, and only three base hits over five innings. In 14 outings spanning 18 2/3 innings, Lamb has struck out 25 and walked nine, allowing just five runs, all earned. The league hit .236 off of the left-hander, and left-handed batters hit just .182 (4-for-22) off of him. The Yorktown, Virginia native is in his fourth professional season and spent all of 2013 in Myrtle Beach. In 39 outings last season, Lamb was 5-3 and posted a 5.17 ERA. He was drafted by the Rangers in second round of the 2011 MLB June Amateur Draft. The Pelicans roster is now at 24 active players, which is one below the Carolina League limit. The Pelicans return to action on Thursday at 7:05 p.m. at TicketReturn.com Field at Pelicans Ballpark, hosting the Wilmington Blue Rocks for three games. The game can be heard live on WRNN AM 1450 ESPN Myrtle Beach, on the TuneIn Radio App, and via the MiLB First Pitch App, beginning with the Hampton Inn Pregame Show at 6:45 p.m. The quick three-game homestand features an appearance by Mountain Man, from A&E's Duck Dynasty, on Saturday June 21, presented by WMBF News.